This large flat is located on the first floor of a late Victorian House with high ceilings and period details. A sophisticated melange of antiques, vintage and contemporary furnishings makes a warm, inviting space for a couple and also for large scale entertaining. Linen Slip Covered Sofa , Area Carpet by Silk Avenue , Parchment & Bronze Coffee Table , Straw Marquetry Credenza , Bronze Lamps , bronze table and accessories all by Alexander Lamont. 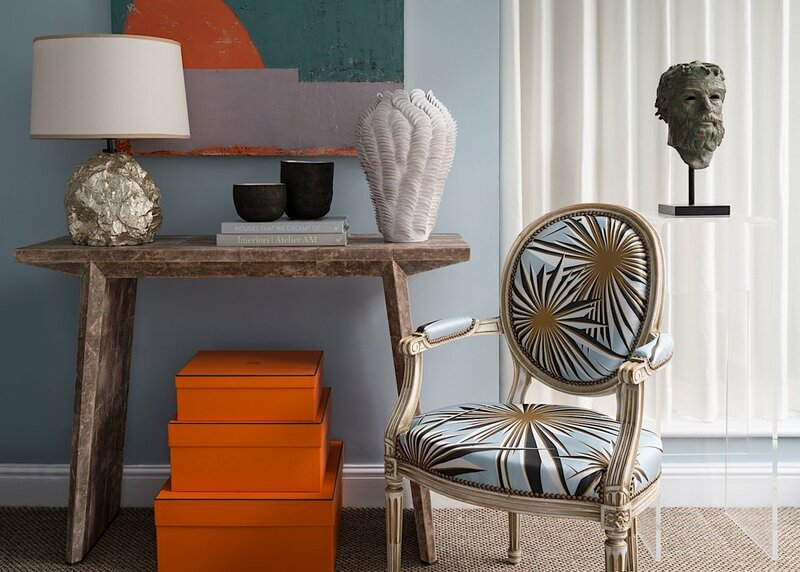 Eames chair & ottoman, Tribal stool, Serge Mouille wall light, bronze torchere by Alexander Lamont. Painting by Joseph Goody. Antique Chinese table, cast brass candlesticks, vase and tray all by Alexander Lamont. Painting by Joseph Goody. Antique Swedish commode, Vintage 1940’s mirror, vintage plaster hanging fixture, parchment tray & vase and bronze & stone table all by Alexander Lamont. Bespoke headboard in a Toyine Sellers material, bronze & shagreen table lamp and parchment & bronze bedside table by Alexander Lamont. Hand woven silk cushions by Oro. Shagreen console table and table lamp by Alexander Lamont. Vintage chair upholstered in a silk design by Tony Duquette for Jim Thompson. Painting by Joseph Goody. Styled by Miles de Lange and Photographer: Zac and Zac.